Yesterday we improved the help in the Analyse-it Standard Edition and added a statistical reference guide. 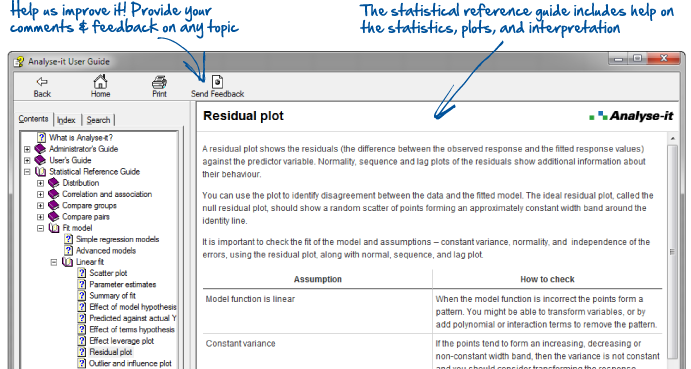 The guide tells you about the statistical procedures in Analyse-it, with help on using and understanding the plots and statistics. It’s a work in progress, and we intend to improve it further with your comments and feedback, but it’s important to understand the role of the guide. Secondly, the guide does not include the mathematical formulas behind the statistics. While an understanding of the mathematics is useful, it is better to understand the practical application of statistics: when and where they can be used, and how to interpret the results. Software makes it unnecessary to know the exact formulas, and often the exact mathematics used in software differ from those in textbooks since optimised routines are used to ensure good performance and numerical precision. Finally, the guide does not explain experimental study design - an area where many mistakes are often made. We recommend you invest in a good textbook on study design to save wasting time on research that is ultimately flawed and cannot be published. The Statistical Reference guide is included in version 3.10 of the Analyse-it Standard Edition. If you have active maintenance you will be notified the update is available when you next start Analyse-it. When you have installed the update you can access the help from the Help icon on the Analyse-it tab. You can provide feedback on any topic in the help using the Send Feedback button on the toolbar within help. If you prefer to read the guide on your e-reader we have published it in EPUB format (suitable for Apple iBooks and other e-readers) and MOBI format (suitable for Kindle readers).